Wine Traditions - Events & News - Read All About It! Irouléguy and Domaine Brana in today's New York Times…..
ST.-ÉTIENNE-DE-BAÏGORRY, France — On a Saturday morning, this village in the French Pyrenees seems like any other small French town. Shoppers wend through the outdoor market while tourists snap photos. But resounding above the ordinary fray are the cries of young men playingpelote, a game akin to jai alai. On an outdoor fronton, or court, adjacent to the market, using a basket shaped like a scimitar, they hurl a hard ball against a wall; it ricochets skyward at incredible speeds, sometimes flying onto the street, obliging passers-by to keep their heads up. Taking it all in, you realize that St.-Étienne, in the heart of Irouléguy in French Basque Country, is a different kind of place. So it is with the wines of Irouléguy (ee-RHOO-lay-ghee), very much part of the constellation of appellations found in the southwest of France yet separate and distinct. It’s not that the grapes are different — the reds are made of tannat, as in Madiran, and cabernet franc and cabernet sauvignon, as in Bordeaux and Bergerac. Whites are made of gros manseng, petit manseng and petit courbu, as in Jurançon. Yet the land, the climate, the language and the culture remain apart, isolated by the Pyrenees, which wrinkle upward in a confluence of steep, verdant slopes like the sides of a giant bowl, containing this land of picturesque towns, rivers and patchwork farms. 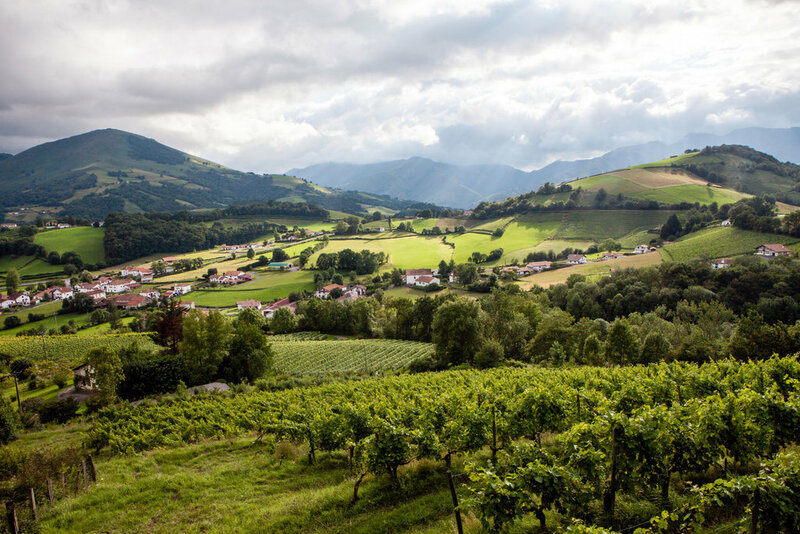 The wine expresses those differences as plainly as the Basque differs from the French on the region’s dual-language signs. I have been obsessed with the wines of Irouléguy for five years. It began with a visit to Bordeaux, where a restaurateur, recognizing that two friends and I were in the region professionally, plied us with a series of wines that he was producing. They were glossy, oaky things, modern and generic, not at all what I would have chosen to drink given the chance. As a refresher before the next round, he offered a rosé from Irouléguy, practically dismissing it as a palate cleanser. Some palate cleanser! Unlike the Bordeaux, this wine was fascinating. It was refreshing, sure, but it tasted almost like blood and iron, with rocks thrown in for good measure. Amid the parade of banality, this rosé stood out as a formidable wine of great character. Back home, I set about tracking down as many wines from Irouléguy as I could. There weren’t many. Irouléguy is a tiny appellation, about as far southwest as you can go in France. Though I found just a handful, the wines were almost always compelling. Mostly, they are reds, yet not the inky black, tannic monsters typical of Madiran. Rather, they are limber, marked as much by acidity as by tannins, with an almost exotic flavor of flowers and red fruits laced with that bloody iron tang. I found them rustic in the best sense of the word, genuine and forthright, without the finesse, perhaps, of the wines of the Médoc or Graves, but also without the artifice. The whites were tougher to find but equally irresistible. They may have tasted like flowers and yellow fruits, but they weren’t fruity. Instead, they were savory, sometimes saline, yet fresh and lively. And the rosés: The few I could find reinforced that initial impression of elemental wines of the earth, worthy of aging, unlike most ephemeral rosés. I resolved that I had to visit Irouléguy to see for myself the soil from which these wines emerged, and the people who shaped them. So it was in June that Irouléguy unfolded before me in all its pastoral splendor. Sheep and cattle grazed on the sharp-angled pastures, next to fields of grain and an occasional orchard. Rivers gurgled along, and though Irouléguy is known for frequent rain, the weather over the course of four days was sunny and hot. St.-Jean-Pied-de-Port, the other major town, is an embarkation point forthe Camino de Santiago, the Christian pilgrimage route that leads to the shrine of St. James at the Cathedral of Santiago de Compostela in northwestern Spain. Dozens of backpackers, preparing for their spiritual walk, wander the main streets. It all reinforced Irouléguy’s Brigadoon-like quality of otherworldliness. Vineyards are not a dominant feature here, as they are in so many wine regions. They are simply one facet of an agricultural way of life, as perhaps they were centuries ago in those other places before wine became an industry. And yet the handful of excellent estates that do focus on wine, like Domaine Ilarria, Maison Arretxea and Domaine Brana, are resolute, seeing it more as a calling than a business. Peio Espil, the grandson of vignerons, started Ilarria in the 1980s, painstakingly constructing terraces on precipitous limestone slopes so he could plant vines. He is a follower of the Japanese agronomist Masanobu Fukuoka, who before his death in 2008 preached a hands-off style of farming that paradoxically requires constant vigilance in the vineyard. In the cellar, Mr. Espil operates in a similar style, avoiding manipulations and, as much as possible, the use of sulfur dioxide, a common wine preservative. Yet his wines are rock stable, and they show an intricate sense of detail that is rare in any region. “I try to work as naturally as possible,” he said as we walked in the vineyard. He described the soil as rich in calcium, iron and magnesium. “It’s healthy for wine and for life,” he said. His wines radiate minerality. The rosé is superb, complex and lasting, as is the lively, intense white and the vibrant, pure red. In the best years, he makes a special red cuvée, Bixintxo. The 2009, still a baby, was substantial yet elegant, with the signature elemental flavors that stamp the wines of the region. Only about 500 acres of grapes are farmed in Irouléguy, equal to a couple of good-size Bordeaux estates and half as much as a century ago, when phylloxera, a ravenous aphid, devastated the vines. Grapes were not grown on a meaningful scale again until 1984, when Étienne Brana, whose family distilled eau de vie, planted a vineyard on red sandstone and began to make wine independent of the local cooperative. Today, Domaine Brana, run by Étienne’s children, Jean and Martine, produces lively, excellent wines, including a refreshing Ilori white and an Ohitza red that is beautifully balanced and graceful. For advice, the Branas often go to a family friend, Jean-Claude Berrouet, who for many years oversaw the winemaking at Château Pétrus, the acclaimed Pomerol estate. Mr. Berrouet, whose father grew cherries in Irouléguy, has consulted with winemakers all over the world. But his desire, he said, was always to return to the land of his heritage. In 1992, he planted four and a half acres of sandstone terraces, primarily with white grapes, and produced his first vintage in 1998. He called his wine Herri Mina, which essentially translates as homesick for the country. Mr. Berrouet aims for grace and balance, making what he calls “nonsophisticated wines, without technology.” He is passionate about tea, and sees it as an analogy for the structure and aromatic expression he seeks in wine. Indeed, his 2013 Herri Mina white is beautifully balanced and lip-smacking, with savory fruit flavors. He also makes a bit of red, entirely cabernet franc, with stony red fruit flavors and impeccable tension and harmony. They persevered and now own about 20 acres, which they supplement with grapes bought from a friend. Searching and experimental, Mr. Riouspeyrous is quick to describe the 40 kinds of soil on his property. He began practicing biodynamic viticulture in 2008. The wines are superb, including a deeply colored, delicious rosé, an almost-exotic white and an energetic, earthy red. A red cuvée, Haitza, is made from older vines. The 2011 was richly flavored and expressive, with great aging potential. Wine is not the only intriguing product of Irouléguy. Bixintxo Aphaule started as a winemaker, but now, with his wife, Pascale, he devotes himself to making cider, which he calls “another leitmotif of the land.” He believes that cider can be as expressive of terroir as wine is, provided that you have a diversity of trees planted on the right soils, and that you work organically. “It’s necessary for the aromas, not a commercial question,” he said. He makes three different vintage ciders under the Bordatto label, and all are well worth seeking out, particularly the elegant, concentrated Txalaparta. What did it taste like? As with the wines, the people and the game of pelote, it was pure Irouléguy. Here are some notable producers of Irouléguy wine and cider, which are difficult to find but worth seeking out.